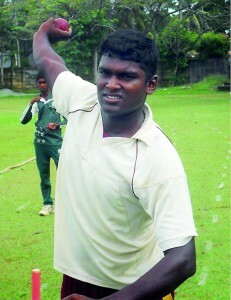 Right-arm fast bowler, Chalanaka Weerasinghe, took a hat-trick to help St. Servatius’ College register a 102-run win, in their Under 19 limited over game against Tissa Central College Kalutara, played at Uyanwatta. Tissa Central’s skipper, DaminduThilanjan asked the hosts to bat first and did well to restrict them to 180 in 41.1 overs. St. Servatius’ skipper Gihan Nimsara resisted the bowlers to score an unbeaten 106 off 111 balls, with 15 boundaries and two sixes. Sanka Chathuranga captured three wickets for 18 runs while Ishara Silva and Dulaj Harshana captured two wickets each. Tissa Central were 31/1 in six overs at lunch but were all out for 78 in 21.1 overs. Yohan Chanuka made the initial breakthrough, capturing three wickets for ten runs from four overs, of which two were wicket maidens. Chalanaka captured a hat-trick to end with figures of 3 for 20. Only Milinidu Sampath and skipper Dumindu Thilanjan reached double figures.